With more people moving to urban settings, the cities such as Portland and Minneapolis that do the most to build transit and bike-friendly streets will be the economic winners. The new demographics are found in two generations deeply influenced by suburbia. First there’s the 20-30 somethings who grew up in suburbia and, like all generations, do not want what their parents wanted. The second demographic are their parents, who are now becoming empty nesters with a five-bedroom McMansions in the suburbs. According to housing and location preference surveys, the younger crowd wants to be in the center of things — downtown. They want cafes, restaurants, entertainment, and other young people to socialize with. 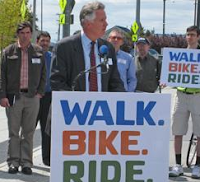 They want walkable communities with parks; they want bike trails; they want to bike to work; and they want transit. At the aging boomer cutting edge, what are they interested in? For boomers, preferences split almost down the middle. Half of the 50-60 somethings want to move to a larger house in a semi rural area. They wanted to build their “Dream House,” the house they wanted all their lives, but deferred it to raise their children. The other half want to move to a central urban area with a walkable, transit-accessible life style. They want easy access to shopping, food, music, art, and health care. I always thought that this split speaks volumes about my generation.